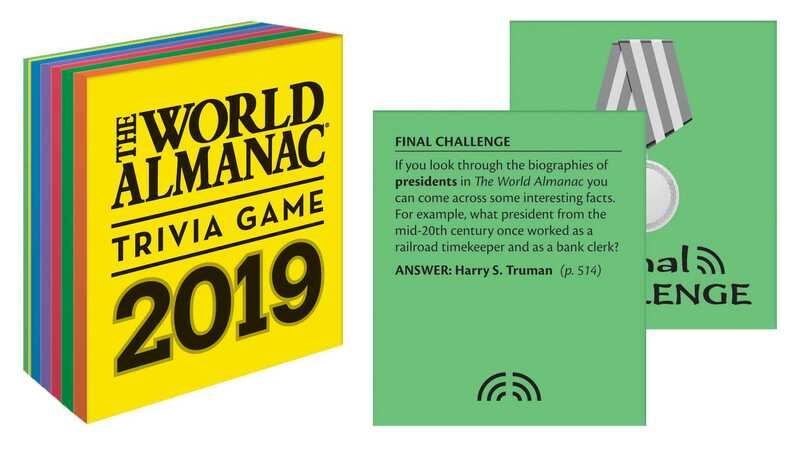 The World Almanac® 2019 Trivia Game will get students excited about learning with its game show-style skills-based challenges. This interactive Q&A card game requires players to listen carefully to trivia questions and work individually or with teammates to find the correct answer within the print edition. The perfect companion to The World Almanac® and Book of Facts 2019, the cards challenge students' natural curiosity as they explore topics from history and sports to geography, pop culture, and much more. Questions are assigned points based on the level of skill required, so everyone from beginners to advanced researchers can play! Use this game to enrich lessons across the curriculum and get students reading, researching, and learning using classroom copies of The World Almanac® and Book of Facts.